A Colorado school district superintendent recommended dismissing the middle school teacher who allegedly claimed on Twitter that a random student was part of the “Hitler Youth,” mistaking him for one of the Covington Catholic High School boys caught in the viral encounter with American Indian activist Nathan Phillips. Michelle Grissom, a seventh-grade social studies teacher at Mountain Ridge Middle School (MRMS) in Colorado, allegedly named and posted a picture of Covington Catholic student Jay Jackson as one of the boys wearing Make America Great Again (MAGA) hats in Washington, D.C., on Jan. 18. Jackson was not in Washington at the time of incident that went viral on social media. Jackson’s dad, John Jackson, repeatedly asked Grissom to take down the tweets, but she only removed them once the district was contacted. Grissom remains on paid administrative leave, DCSD Public Information Officer Paula Hans said to The Daily Caller News Foundation over email. The social studies teacher has the right to request for “a hearing on the basis for the dismissal,” according to the statement. 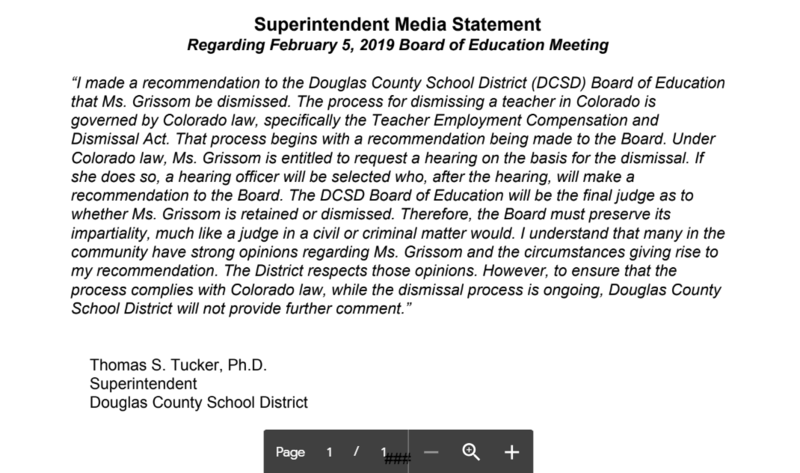 “I understand that many in the community have strong opinions regarding Ms. Grissom and the circumstances giving rise to my recommendation,” Tucker said. John Jackson tweeted that his son faced harassment and bullying due to Grissom’s accusations. “My son was upset and fearful that his future would be ruined and this would follow him for the rest of his life,” John Jackson previously told TheDCNF. Many have tried to doxx the Covington Catholic boys over the encounter with Phillips, assuming they were mocking the American Indian activist. A Covington bishop, March for Life and others have apologized to the Kentucky students for making snap judgments before the full, unedited video came out. Lawyers for Nick Sandmann, the student who was face-to-face with Phillips, are sending letters to media organizations and celebrities who vilified the students. This is the first step in a potentially big libel and defamation lawsuit.